Publisher, bookseller, and sailboat dealer (what a combo) Broadfoot has launched a new series of regimental histories along the line of H.E. Howard's Virginia unit books, but hopefully with some editorial oversight. See this messageboard post for more information (thanks for the tip, Art). Nothing yet on the publisher website that I could see, but I now have my eye on a 19-footer sloop. Newspaperman Kirby Ross is a very impressive avocational historian of the much understudied Civil War in SE Missouri. 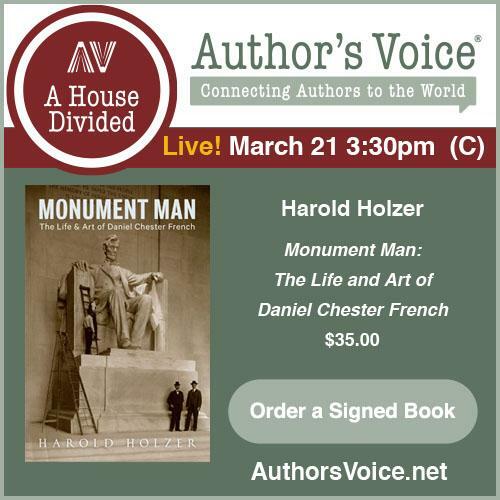 Today, he was interviewed by Gerald Prokopowicz on Civil War Talk Radio about Ross's edited new edition of the Autobiography of Samuel S. Hildebrand: The Renowned Missouri Bushwhacker. Follow this link to the show's webpage and look for the three-part 5/30/08 program. For me, the best part of the interview is the part three discussion about the region's troubling historiography. The Battle of Massard Prairie: The 1864 Confederate Attack on Fort Smith, Arkansas by Dale Cox (Yuchi Heritage Publication, 2008). With his new publication, Dale Cox makes a change of scenery from Florida [Marianna and Natural Bridge] to the western border of Arkansas. Caution and Cooperation: The American Civil War in British-American Relations (New Studies in U.S. Foreign Relations) by Phillip E. Myers (Kent State Univ. Press, 2008). Thanks to Dimitri Rotov for pointing this one out on his blog. I missed it, too. Southerners at Rest: Confederate Dead at Hollywood Cemetery by Chris Ferguson (Angle Valley Press, 2008). Ask a Civil War reader to name the first cemetery that comes to mind and there's a good chance the answer will be "Hollywood" in Richmond. Here, Chris Ferguson, also the author of Hollywood Cemetery, Her Forgotten Soldiers: Confederate Field Officers at Rest, provides a detailed tabular compilation of the most up to date interment list, along with over 100 photographs. The 11th Wisconsin in the Civil War: A Regimental History by Chris Wehner (McFarland, 2008). The service histories contained in Civil War regimental studies are typically meatless fare written from an uninspiring perspective; however, the better ones contribute new knowledge and fresh interpretations to events beyond the unit's individual experience. Fellow blogger Chris Wehner's book thankfully resides among the latter, especially with his extensive coverage of Samuel R. Curtis's campaign in northeast Arkansas in 1862. A Rough Introduction to This Sunny Land: The Civil War Diary of Private Henry A. Strong, Co. K, Twelfth Kansas Infantry ed. by Tom Wing (Butler Center for Arkansas Studies, 2006). A valuable diary account of service in Missouri, Arkansas, and the Indian Territory. The Battle of Shiloh and the Organizations Engaged by David W. Reed (Univ. of Tennessee Press, 2008). This is the first reprint of Reed's classic study since the 1913 revised edition. The UT Press edition has a new introduction by Timothy B. Smith and a companion CD that contains reproductions of Reed's color maps in .pdf format [I believe these were large pullouts in the early 20th century editions]. The number of delayed publications and a lull in May-June releases should allow me some needed time to catch up on my reading. King Cotton Diplomacy: Foreign Relations of the CSA (3rd edition) by Frank L. Owsley. The Fate of Texas: The Civil War in the Lone Star State ed. by Charles Grear. The Lincoln-Douglas Debates: The Lincoln Studies Center Edition eds. Rodney O. Davis and Douglas L. Wilson. The Lincoln Assassination: The Evidence eds. Edward Steers and William C. Edwards. Confederate Phoenix: Rebel Children and Their Families in South Carolina by Edmund Drago. Gustavus Vasa Fox of the Union Navy: A Biography by Ari Hoogenboom. Faces of the Confederacy: An Album of Southern Soldiers and Their Stories by Ronald Coddington. Abraham Lincoln: A Life by Michael Burlingame. Burlingame's bio is 1,952 pages in a slip cased two-volume set. Drop hints to favored loved ones around Christmas time. The Rifle Musket in Civil War Combat: Reality and Myth by Earl Hess. Seeding Civil War: Kansas in the National News, 1854–1858 by Craig Miner. Kentuckians in Gray: Confederate Generals and Field Officers of the Bluegrass State ed. by Bruce Allardice and Lawrence Hewitt. Virginia at War, 1863 eds. William C. Davis and James I. Robertson. Jefferson Davis and the Civil War Era by William Cooper. The Papers of Jefferson Davis, Volume 12 ed. by Lynda Lasswell Crist, Suzanne Scott Gibbs, Brady Hutchison, and Elizabeth Henson Smith. Thomas Ewing Jr.: Frontier Lawyer and Civil War General by Ronald Smith. The Making of a Southerner: William Barclay Napton's Private Civil War by Christopher Phillips. Confederate Colonels: A Biographical Register by Bruce Allardice. Lincoln's Veteran Volunteers Win the War: The Hudson Valley's Ross Brothers and the Union's Fight for Emancipation by D. Reid Ross. Antietam, South Mountain, and Harpers Ferry: A Battlefield Guide by Ethan Rafuse. Shenandoah 1862: Stonewall Jackson's Valley Campaign by Peter Cozzens. Disunion! The Coming of the American Civil War, 1789–1859 by Elizabeth Varon. Freedom: A Documentary History of Emancipation, 1861–1867 Series 3, Volume 1: Land and Labor, 1865 eds. Hahn, Miller, O’Donovan, Rodrigue, and Rowland. Mutiny at Fort Jackson: The Untold Story of the Fall of New Orleans by Michael Pierson. Gender and the Sectional Conflict by Nina Silber. 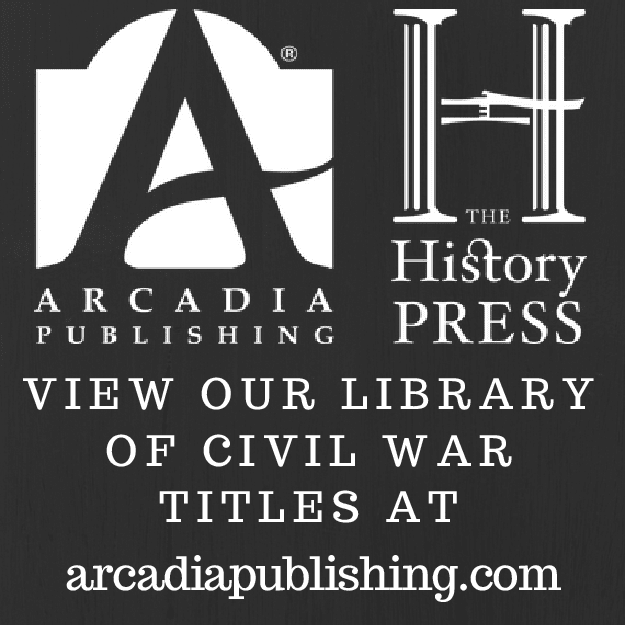 North Carolinians in the Era of the Civil War and Reconstruction ed. by Paul Escott. Within a few weeks, I hope to finish my reading of the Cozzens ARC. Varon's book will be the first of a new series The Littlefield History of the Civil War Era. Modern inquiries into the fall of New Orleans continue to absent themselves from the work of historians, so Pierson's book is certainly welcomed. Missouri's War: The Civil War in Documents ed. by Silvana R. Siddali. A Just and Righteous Cause: Benjamin H. Grierson's Civil War Memoir ed. by Bruce J. Dinges and Shirley A. Leckie. Cumberland Blood: Champ Ferguson's Civil War by Thomas Mays. I could imagine the Mendoza book having a wide appeal among CW readers. Putting aside Chickamauga and Chattanooga, little has been written about Longstreet's 1863-1864 East Tennessee campaign. "Roll Call to Destiny: The Soldier's Eye View of Civil War Battles"
Brent Nosworthy's latest book Roll Call to Destiny: The Soldier's Eye View of Civil War Battles [Basic Books, 2008] is a direct offshoot of his earlier study, the massive The Bloody Crucible of Courage: Fighting Methods and Combat Experience of the Civil War . In some ways, Call to Destiny could be regarded as a distillation of Bloody Crucible [esp. with the weapons & tactics sidebars, and the placement of the ACW within contemporary European military theory and tactical doctrine], but the current work stands alone in its extended micro examination of various, and very specific, tactical situations that Civil War soldiers experienced. In my view, it's also a better book in that the focus is much sharper, eliminating the extended off-topic wanderings that characterized the earlier work. Situational scenarios are drawn from both famous and more obscure battles across the three major theaters* of war, and involve discrete unit vs. unit actions between and within the three service branches (infantry, cavalry, and artillery). The study integrates physical elements such as weather, terrain, and man-made defensive impediments as well. While grizzled veterans of modern micro-tactical battle histories may contest Nosworthy's claims about mass deficiencies in the literature, I appreciate his larger contention that "magnification" often results in shifting interpretations and perceptions of battles and remains an important means of understanding their conduct. * - perspectives drawn from the battles of First Bull Run, Fair Oaks, Fredericksburg, Arkansas Post, Gettysburg, Fort Sanders, Missionary Ridge, and Darbytown Road. DW: Hi John, thank you for agreeing to an author Q&A. My intense background search (well, I typed your name into google) finds that you spend your working days as Senior Manuscript Specialist at the Western Historical Manuscript Collection in Rolla, Missouri. For those of us unfamiliar with the inner goings on of the archive repository, could you enlighten us as to what your typical daily duties might entail? JB: The Western Historical Manuscript Collection is a joint collection of the State Historical Society of Missouri and the University of Missouri, with offices at each of the UM campuses. At Rolla, we have a broad-based regional collection covering 53 counties in southern Missouri . Individual collections can be single items or hundreds; everything from Civil War letters and family papers to records of schools, churches, and fraternal organizations, photographs, local ephemera, etc. My duties involve accessioning, processing, and cataloging the material, responding to patron requests (in person, by mail, and email). I also handle a lot of general queries about Civil War and local history as a consequence of the job and my own interests. DW: I realize this might be a small question requiring an answer far greater than the space we have here, but, in general terms, can you speak to what Civil War-related materials are part of your collection at Rolla? Are there particularly important manuscripts under your charge that you find Civil War researchers continually fail to appreciate? JB: Well, here's the short answer: LINK. Our Civil War collections are actually used frequently, especially Lyman G. Bennett, Moses J. Bradford, and Acquilla Standifird. Underutilized collections are the Charles Rubey, Tallman family, R. G. Woodson, and Clark Wright papers, as well as any of the GAR and UCV records. 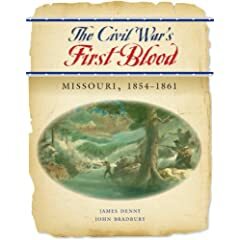 DW: I couldn't obtain copies to read in preparation, but you've published a couple short works dealing with Phelps County (MO) and the Civil War [(Bradbury, John F. The Old Phelps County Courthouse and the Civil War. Rolla, MO: Old Courthouse Preservation Committee and the Phelps County Historical Society, 1999. 24p.) and (Bradbury, John F. Phelps County in the Civil War. Rolla, MO: The Author, 1997. 26p.)]. Of the events that occurred there during the war, which do you consider the most notable? JB: Rolla happened to be a railhead on the direct military line between St. Louis and Springfield and was one of the strategic plums Lyon gobbled up in June 1861. Nothing happened thereafter! The feds never gave up the railhead and southern forces never attacked. The permanent garrison was rarely less than a thousand men; thousands of other troops wintered here or passed through en route to Pea Ridge and Prairie Grove. Rolla became a district headquarters post and logistical node for federal forces in southwestern Missouri and northwestern Arkansas. Nearly everything needed in the field or at Springfield was transferred from railcars to wagons at Rolla. Just as a freighting operation the effort was substantial. For example, over a thousand civilians, mostly wagonmasters and teamsters, worked for the Rolla quartermaster supporting operations during the Prairie Grove campaign. The most notorious incident occurred in August 1865 after the war formally ended. Miller County militiamen came into Phelps County and arrested a former county judge and four of his sons south of Rolla in a case involving property allegedly stolen in Miller County by another of the judge’s sons (and former Confederate soldier). The militia party started back to Rolla, but the prisoners never made it--"shot while attempting to escape." Most people around here thought the killings were murder, and they were especially controversial as a sitting member of the Missouri legislature, Thomas J. Babcock, led the militia party. Partisan newspapers in St. Louis whipped up the controversy, resulting in an investigation and exoneration Babcock by a committee of the Radical legislature. The incident derived from guerrilla-ism and depredations between Rolla and Springfield in 1864. Occurring while federal troops were withdrawing from Missouri, the killings signaled the determination of the state’s Radical administration to kill or drive out the remaining recalcitrants. Which leads to your next question. DW: Switching gears a bit, you recently co-edited (with Lou Wehmer) a new edition of Monks' "A History of Southern Missouri And Northern Arkansas" [see link in intro]. What inspired you to undertake a modern revisit? JB: Anyone looking into the war along the southern border of Missouri will run across William Monks. He had quite a career as prisoner/refugee/scout/cavalry captain/postwar militia officer/attorney and litigant. He was a lightning rod. Everyone seemed to have an opinion about him, and I can't think of another Missourian who invaded Arkansas after the Civil War, not once but maybe twice! Any account by a federal counter-insurgent leader is rare and postwar narratives by Radical Republican operatives are even rarer, so Monks's history was a prime candidate for republication. If I hadn't gotten together with Lou Wehmer I'd have probably never undertaken it. DW: Of your many published journal and magazine articles, I've only managed to read one -- a fine article by the way ["'This War is Managed Mighty Strange': The Army of Southeastern Missouri, 1862-1863." Missouri Historical Review 89 (October 1994): 28-47.] -- so I only have a thin grasp of your range of interests. What do you consider to be your main research and writing subject area? JB: I suppose I’m a student of the Ozarks, particularly during the Civil War. The region lends itself to study as a distinct geographical and cultural region and also as a discrete military theater within the Trans-Mississippi. DW: Your latest book, co-authored with James Denny (and reviewed here) was published by Missouri Life magazine. What led you and Denny to team up with a magazine (an unusual but not unheard of publishing partnership)? JB: I've written a few things over the years for non-academic venues, so it wasn't much of a stretch to write for a broader audience. In this particular case, the Civil War is about the only topic in American history that commands widespread popular interest. Missouri Life already had a dedicated readership and an attractive vehicle. With the sesquicentennial of the war coming up the project seemed like an opportunity. DW: What was your main goal in writing "The Civil War's First Blood"? Are there any plans to turn it into a series of year-length examinations of the war in Missouri? JB: There needs to be a modern retelling of the war in Missouri. There are many excellent titles on one aspect or another, but we thought a well-illustrated narrative might satisfy those who know something about the subject as well as those who'll come to it for the first time during the sesquicentennial. There’s plenty more to the tale, but it gets more complex and harder to tell. Maybe there’ll be another volume or two if the response to First Blood is good. DW: I hope so. I am always curious about the co-authoring dynamic. How did you and Denny manage the process? JB: Jim did most of the heavy lifting in First Blood. We parceled out chapters according to our interests and passed our drafts back and forth for mutual editing. Readers might guess which chapters began as Jim's and which were mine, but the finished narrative is a collaborative affair. Jim also assembled a marvelous selection of images and maps. DW: He did. There were some marvelous photographs included, and more than one map containing details not found in other published maps [First Boonville comes to mind]. Nearing the end, I'd like to ask you the same question I asked Jim McGhee. What do you find least appealing about the overall publishing picture of Missouri related Civil War books, and what are your favorite least known and underappreciated CW Missouri books? JB: The last 20-30 years saw some very good Trans-Miss and Missouri scholarship; I expect much more to come out of the provost marshal files and judicial cases now becoming accessible in Missouri. I’d agree with McGhee that certain guerrillas may have been overdone, but there is modern interest these days in guerrilla warfare and counterinsurgency. Surely there are some lessons in Missouri’s experience. For anyone interested in “Old School” topics, the Battle of Lexington, the Missouri State Militia, and Price’s Expedition all come to mind; there are several major biographies, regimental histories, and any number of regional studies yet to be written, and not for lack of sources, either. I don’t know about my favorites, but right now I’m rereading Serving with Honor: the diary of Captain Ethan Allen Pinnell, 8th Missouri Infantry (Confederate) (The Camp Pope Bookshop, 1999), and Marching With the First Nebraska: A Civil War Diary by August Scherneckau (University of Oklahoma Press, 2007). Both are excellent accounts with rich details. DW: Finally, do you have other researching and writing projects in the works (that you can speak of publicly anyway)? JB: Nothing about to bear, but I’m still interested in refugees in the Ozarks, some of the figures like Monks involved in counterinsurgency, and obscure sources like quartermaster records. DW: Very good. Thanks once again for your time, John; and, readers, please check out his recent publications The Civil War's First Blood: Missouri, 1854-1861, and A History of Southern Missouri And Northern Arkansas: Being an Account of the Early Settlements, the Civil War, the Ku-Klux, And Times of Peace . Ecelbarger: "Three Days in the Shenandoah: Stonewall Jackson at Front Royal and Winchester"
Even the best examples of military studies from the 1862 Valley Campaign literature, publications from the likes of Robert Tanner and Robert K. Krick , are heavily weighted toward the Confederate viewpoint of events. 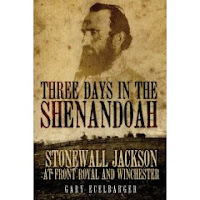 Regardless of what one might suppose from the subtitle, Gary Ecelbarger's new book Three Days in the Shenandoah is a refreshingly balanced study of the battles of Front Royal and Winchester. In regard to assessing Stonewall Jackson's leadership performance, the author's writing is remarkably disinterested in nature. A strong yet fair critic, Ecelbarger's judgments are centered on a careful weighing of evidence gleaned from primary sources. He also avoids suffusing his narrative with a language and admiring tone more reflective of the future Jackson, the one of legend. Carefully presenting the options available to both sides in terms of the information available at the time, Ecelbarger deals out praise and censure with equally studied measure. While ultimately successful in achieving the goals outlined by his superiors, Stonewall Jackson committed numerous tactical errors from May 23-25 that greatly limited the scope of his twin military victories. Jackson's operational movements prior to May 23 placed him in a highly advantageous position relative to Banks's main body at Strasburg. While Federal forces were nearly annihilated at Front Royal on the 24th, and broken at Winchester the next day, the results should have been much worse for the U.S. army. Operationally, Jackson concentrated on single approaches, and, tactically, he committed his forces slowly and piecemeal on the battlefield. For the most part, the artillery was grossly underutilized, and, with the grand exception of Cedarville1, the cavalry's performance was abysmal2. For all this, Jackson fulfilled his orders to press the enemy to the Potomac and threaten points beyond. Garnering some needed supplies and inflicting heavy casualties on Banks's force was a bonus. All these points the author addresses in detail. Taking into account Nathaniel Banks's tactical errors, Ecelbarger's assessment of the Bay State general's 72 hour performance is largely forgiving, and often positive. His case is persuasive. Two freak events3 beyond Banks's personal control led to the majority of Federal losses (mostly in prisoners), but the Union general was nevertheless able to save, by the author's estimation, 80% of his vast supply train and 75% of his heavily outnumbered command. The general's derisive sobriquet of "Commissary" Banks, stemming from this period, appears undeserved. With both commanding generals making errors of similar scale, the difference in outcome can be largely attributed to Jackson's determination, backed by superior numbers. As demonstrated earlier by his history of the Battle of Kernstown, Ecelbarger again showcases in Three Days in the Shenandoah his mastery of the campaign and battle narrative. The text is highly detailed, yet smoothly follows the course of the fighting at the level of the company and regiment. The tactical scale elements of the author's writing and analysis, which include appropriate discussions of terrain, weapons, formations, and unit tactics, are first-rate. Broader operational and strategic level contexts are also carefully pinpointed. Overall, there is precious little in the author's analysis upon which to quibble. Ecelbarger's research, strongly based upon unpublished materials, is deep. It is easily apparent that he operates outside a preconceived interpretive framework, allowing the evidence to freely guide him. This is a consistent property of Ecelbarger's scholarship, and something rarer to the general run of Civil War publishing than we would like to admit. A few points, however, would perhaps have benefited from a more expansive treatment or point of emphasis. Ecelbarger discovered that the effective strength of Jackson's Valley District command decreased by almost 50% between the battles of McDowell and Front Royal. He mentions the heavy straggling and desertion, but I believe the factors behind such a drastic strength reduction was deserving of further inquiry. 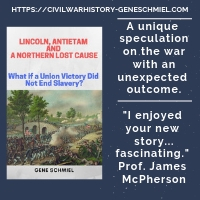 In terms of the strategic consequences of the Confederate victories at Front Royal and Winchester, I wish the author had dwelled more deeply upon the catastrophic effects of Lincoln's direct intervention into the planned movements of eastern theater forces, certainly one of the greatest operational blunders of the war and a fatal blow to McClellan's Peninsula Campaign. Devoted readers of modern Civil War campaign studies rightly hold high expectations in the area of cartography, and the mapset from Three Days is certainly better than average. The tactical diagrams depict unit positions and movements at company and regimental level, while the operational maps trace brigade and divisional maneuvers. Although lacking discretely drawn representations of some common features of the natural terrain (e.g. wood lines and fields), the maps are otherwise clear and appropriately detailed. A first-rate Civil War contribution to Oklahoma's "Campaigns and Commanders Series" [Vol. 14]4, Three Days in the Shenandoah fulfills, and more often exceeds, all the requirements of a modern battle history. Gary Ecelbarger's fresh study also provides a challenging reassessment of the relative performance of the campaign's two chief antagonists, Banks and Jackson. Highly recommended. 1 - Near Cedarville on the evening of May 23, in what must have been one of the most impressive saber charges of the war, four companies of the 6th Virginia cavalry nearly wiped out the remnants of Kenly's brigade (650 men) on its retreat from Front Royal. 2 - The poor discipline of Ashby's cavalry is well known, but the incredible degree of desertion and straggling in the infantry is indicative of a serious deficiency in that branch as well. It's a fascinating subject, especially in light of Jackson's own personal views on military duty, and worthy of further study. 3 - The unusually successful saber charge against a superior infantry force at Cedarville on the 23rd, and the inexplicable tactical withdrawal on the right flank at Winchester [a loosely analagous "Wood at Chickamauga"-type event] that led to the collapse of the Bower's Hill line. 4 - See also, Mackey and Einolf. I don't have a copy of the latter, but Mackey's scholarship dealing with the irregular conflict in The Uncivil War is impressive. This is a updated reworking of an earlier post dealing with Civil War book award announcements. Nelson Lankford's book Cry Havoc! The Crooked Road to Civil War, 1861 (Viking, 2007) is the winner of the 2008 Dan and Marilyn Laney Prize (a $2000 cash prize administered by the Austin Civil War Round Table to "the book that best advances the knowledge of the Civil War's military or political events and the Americans who took part in those events"). I've been informed that the winner of the 2008 Albert Castel Book Award (presented by the Kalamazoo Civil War Round Table biennially to the "author of the best recent book on the Civil War in the Western Theater") is Steven Mayeux for Earthen Walls, Iron Men: Fort DeRussy, Louisiana, and the Defense of Red River (Univ. of Tennessee Press, 2007). So far, I've been unable to discover a webpage devoted to this prize. Readers may remember Mayeux as the recipient of the 2007 A.M. Pate Award (also for Earthen Walls). The Richard B. Harwell Book Award for the "the best book on a Civil War subject published in the preceding year" (CWRT of Atlanta) went to Elizabeth Brown Pryor for Reading the Man: A Portrait of Robert E. Lee Through His Private Letters (Viking, 2007). Looks like it was a good year for big press Viking on the Civil War book award circuit. Smith: "Le Roy Fitch: The Civil War Career of a Union River Gunboat Commander"
Mid-level navy officers, especially those that plied the western river systems and contributed mightily to the ultimate success of the U.S. war effort, comprise a neglected segment of Civil War biographical scholarship. Happily, Myron J. Smith's fine military biography of Indianan Le Roy Fitch goes a long way toward remedying the situation. Bookended by chapters covering the subject's early years and postwar career, Smith's main narrative is a broadly inclusive, and incredibly detailed, recounting and analysis of Fitch's Civil War naval service. Le Roy Fitch made a name for himself with the organization and protection of supply convoys up the Cumberland River after the fall of Nashville. In addition to the Cumberland, he also conducted successful counter-guerrilla operations along the Ohio and Tennessee rivers. 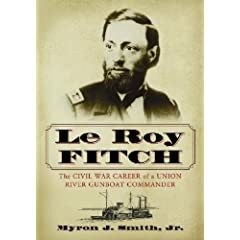 For his book Le Roy Fitch: The Civil War Career of a Union River Gunboat Commander, author Myron Smith has researched and recounted these actions in such depth as to place all future investigators of the logistics of the 1862-1864 western campaigns in his debt. Smith highlights the unpredictable nature of these rivers as supply conduits, and the lack of appreciation by high ranking army officers [especially William S. Rosecrans, and to a lesser extent Grant] for the natural and man-made difficulties to be overcome. In addition to suppressing attacks by guerrillas and guarding supply convoys, Fitch also played a pivotal role in trapping John Hunt Morgan's raiders near Buffington Island in July 18631. Smith's account of the navy's critical contribution to Morgan's defeat is the most detailed I've come across, and will likely be a bibliographical mainstay of future historians of the "Great Raid". The next year Fitch commanded a failed relief force at Johnsonville, but later performed admirably in breaking up Confederate attempts at blockading the Cumberland during Hood's Tennessee campaign. With brief interludes, tinclad commands characterized Fitch's Civil War naval career, and, viewed through this lens, Smith's study might also be considered a treatise2 on the capabilities and operational use of this gunboat class on western waters. Performing the lion's share of patrolling, escorting, and reconnaissance duties during the war, the tinclads were the true workhorses of the Brown Water Navy. Smith's research and explanatory endnotes are extensive. His heavy use of internet sources for general background information (e.g. Wikipedia) might be questionable; but, overall, the author consulted a satisfying range of source materials (including manuscripts, newspapers, government records, theses, books, and articles in a lengthy bibliography). Concerns with the book center around editing and presentation issues. While a nice array of illustrations were included, there are too many typos, and the archival map reproductions are lacking in number and detail commensurate with the text. Above complaints aside, Smith's study is one of the more important additions to the Civil War naval literature in recent years. Beyond providing a solid account of the life and career of a neglected, yet important officer, Le Roy Fitch: The Civil War Career of a Union River Gunboat Commander makes numerous original contributions to the study of riverine combat and logistics in the western theater. 1 - Frequent citing of Horwitz (in the text, consistently misspelled as Horowitz) would not be my first choice for background information on the raid, but that incidental material is largely divorced from the naval aspects presented in the forefront. 2 - This book is surely one of the more remarkable specialized CW naval histories available, at a degree of detail that's unusually dense. At 424 pages, Smith's study is much lengthier than the publisher's typical CW-related offering. Additionally, the print on the book's 7 x 10 pages is closely packed and relatively small. It's a big study for the serious student. 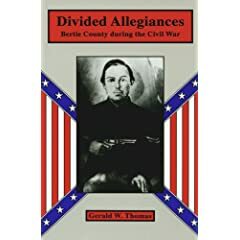 "Divided Allegiances: Bertie County during the Civil War"
Author Gerald W. Thomas* modestly admits to being no historian, but his book Divided Allegiances: Bertie County during the Civil War (North Carolina Division of Archives and History, 1996) is of a quality that would certainly make any historian proud. Bertie County, North Carolina occupies a strategic position at the west end of Albemarle Sound, forming a peninsula of sorts bounded by the Chowan and Roanoke rivers. Thomas mined census data and county records to present to the reader in text and chart form the pre-war economic and political makeup of the county. As Chris Meekins discovered for nearby counties in his fine book Elizabeth City, North Carolina and the Civil War, Bertie citizens were divided in their support for the Confederacy. The initial wave of Confederate volunteers were sent north, leaving the county undefended during and after Burnside's expedition that captured much of the state's seaboard. Mounting resentment and resistance to the Conscription Act, led large numbers of deserters, unionists, and neutral whites into the ranks of the 1st and 2nd North Carolina (US) regiments. An even larger number of slaves fled the county and enlisted into several North Carolina colored units. Like Meekins, Thomas describes in some detail regular military and guerrilla operations in the area, and the precarious situation this destruction and disruption created for Bertie County civilians. Appendices list by company and regiment those county residents that served in the US and CS armies. I would highly recommend this soundly researched and very well written county history to anyone interested in Civil War North Carolina. * - Thomas also co-authored the influential article "Massacre at Plymouth: April 20, 1864." [Weymouth T. Jordan Jr. and Gerald W. Thomas. North Carolina Historical Review, Vol. 72 (April 1995): 125–197]. McGhee: "Guide to Missouri Confederate Units, 1861-1865"
Civil War reference works that are enjoyably readable from cover to cover, yet are at the same time able to meet or exceed the exacting standards of professional researchers, are relatively rare. 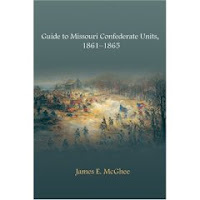 Students of Civil War Missouri and the Trans-Mississippi theater in general will be gratified to learn that James E. McGhee's Guide to Missouri Confederate Units, 1861-1865 qualifies as just such a study. It holds the further distinction of being the first modern and truly comprehensive Missouri unit guide. McGhee's book utilizes a structure similar to that found in Arthur Bergeron's Guide to Louisiana Confederate Military Units (LSU Press, 1989). Military organizations from all three service branches -- artillery (batteries), cavalry (regiments, battalions, squadrons, and independent companies), and infantry (regiments and battalions) are exhaustively compiled. Even units that failed to completed their organization are investigated. Field grade officers are listed as well as company commanders. If the information is available, the counties each company was primarily drawn from are indicated in parentheses. The author also ably navigates the reader through the reorganizations and consolidations many Missouri units were put through during their period of service. A one to two page length narrative summary, a concise service history from initial muster to final surrender, was written for each unit. Such compression cannot have been an easy task, but McGhee handled the job superbly. His overviews are models of useful thrift, providing the most amount of useful information in a limited space. They are also remarkable for their consistency. McGhee admirably avoids the common tendency to lavish attention upon the more "famous" units while devoting only a cursory look at the lesser lights. Particular attention is paid to strengths and casualties at significant junctures, with a final computation at the end. In terms of weaponry information, tube types are given for the artillery units. The abundant detail should more than satisfy a broad range of interested readerships, from hobbyists and casual researchers to historians, genealogists, and wargamers. Illustrations are sparse overall, but a gallery of photographs, some rare and perhaps published here for the first time, was thoughtfully included. Unfortunately, a few of the images suffered adversely from the reproduction process; a minor cosmetic flaw in a uniformly impressive book. The range of research materials [manuscripts, government records, books, and articles] examined by the author is wide reaching. A short list of sources is placed at the conclusion of each unit entry, with a larger supplementary bibliography placed at the rear of the book. James E. McGhee's Guide to Missouri Confederate Units is deeply researched, skillfully compiled, deftly organized, and remarkably complete. It is truly an authoritative reference book that deserves placement in home libraries and institutions across the country. Anyone who has written for magazines, only to be jerked around when the time came for you to receive your agreed upon compensation will appreciate this. I had a good belly laugh at the YouTube excerpt of a Harlan Ellison interview at the bottom of the page [avoid it only if you are easily offended by crude language]. The Spring 2008 edition of Civil War Book Review is out. Among other things of interest is the reviewer bio blurb for Christopher Stowe of the U.S. Army Command and General Staff College which mentions he is completing a two-volume biography of George Meade for Kent State Univ. Press. Brett has already mentioned the Glatthaar interview from the same issue on TOCWOC. Blogger Andrew Duppstadt has a review of Joiner's Mr. Lincoln's Brown Water Navy. I think we are in agreement as to its positive qualities. Dimitri has posted the first of a two-part interview with Russell Bonds, author of one of the best Civil War books of recent memory, and a startlingly good effort for a first time author. I anticipate with great pleasure his next work, a much needed history of the Battle of Atlanta. Kirby Ross, editor of The Autobiography of Samuel S. Hildebrand: The Renowned Missouri Bushwhacker, will be a guest on Civil War Talk Radio on May 30.